After work on Thursday, I drove from my Parents to Clarion, PA for a non-conference game between the Clarion Bobcats and the St. Marys Flying Dutchmen. 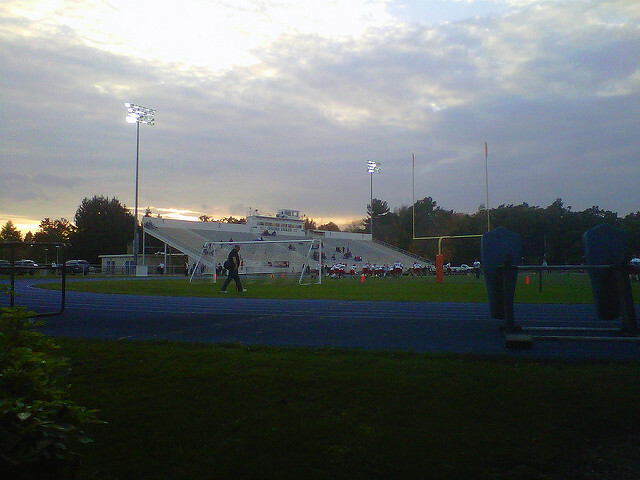 Clarion is a Single-A school in Pennsylvania and plays at the local college’s stadium. Memorial Stadium is home to Clarion University’s Golden Eagles and is quite large for such a small high school. Seating 5,000 it dwarfs what would be necessary. The stadium has a track and field turf with the Clarion University logo at midfield and is generally nice. The Thursday game is because Clarion is hosting their annual Autumn Leaf Festival, abbreviated to ALF. The game is, like in Caldwell for the fair, an additional event of the week. Clarion is one of the few PIAA schools that regularly uses the “Area” wording in their name. In Pennsylvania, most school districts are “(something) Area School District”. Similar to Texas’ penchant for Independent School Districts (ISDs). However, in Pennsylvania, the Area name tends to filter through to the high schools. Some high schools are legitimately labeled with Area in their name, while others simply use it by proxy. One prominent one from the Pittsburgh area would be “Moon Area”. However, most schools that the PIAA recognizes as “Area High Schools” don’t actually put Area in their official name. My alma mater, for instance, was Greenville Junior/Senior High School. But, for sports went by GHS or Greenville High School. However, the PIAA recognizes them in records as “Greenville Area”. District 10 is full of schools that are labeled “Area” despite not really being titled that. Not that big of a deal, but it’s a pet peeve of mine when a school isn’t called what it’s really named. Now, back to Clarion and the game. To refresh the uninitiated, Pennsylvania is split into 12 districts and each one operates independently of the rest of the state. The only requirement is that the ‘level’ for each district corresponds to the four classifications in the PIAA. Clarion and St. Mary operate in District 9, a mostly rural north-central district comprising the Allegheny Mountains and mostly above I-80. District 9 has 17 (A) schools, 5 (AA) schools, 3 (AAA) schools, and only 1 (AAAA) school. DuBois is the lone 4A school, and plays in District 10, Region 5 (although they qualify for the state playoffs through District 9, but immediately join a subregional playoff between Districts 6, 9, and 10. It’s convoluted. The three 3A schools are Punxsutawney, Clearfield, and Bradford. The only 2A schools are St. Marys, Moniteau (a team I saw earlier), Karns City, Kane, and Brookville. The rest are all small school. There is only one private school: Elk County Catholic which is based out of St. Marys. These are a lot of small schools. Clarion and the surrounding schools (Allegheny-Clarion Valley and Clarion-Limestone) probably could be consolidated easily with Clarion. They still would be small. The game was fun. 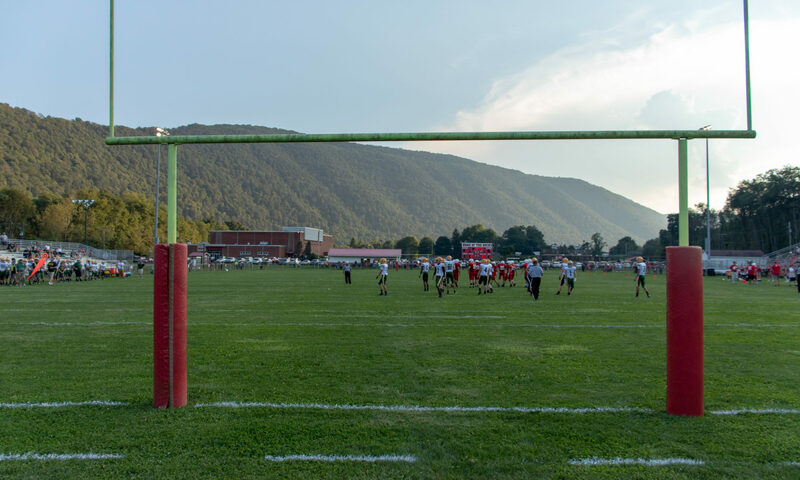 The stadium is located just west of the main part of town where route 322 makes a hard turn north and down the hill. The stadium is pretty standard, with the concession and facilities below the seating area. The best were the souvenirs. $3 for chair back seats and $1 for normal seat cushions. By far the cheapest I’ve ever found them. Tickets were only $4 (the going rate through much of rural Pennsylvania) and $4 for a program. Also, for $6 was a very thorough history book of the team that includes both team and individual records and the entire season-by-season history of the team. Quite impressive for such a small school to put on. The game was predicted to be a blowout and it was looking to end that way. Clarion won the toss and deferred to the second half. Only then they deep onside kicked and recovered. They scored, but gave up a turnover in bad field position to St. Marys to let them tie it, 7-7. The rest of the half was all clarion, as they ran up a 33-7 halftime lead. Early in the third, St. Marys scored to make it 33-14 before Clarion took back seven to make it 40-14. A 72-yard run for a TD made it 40-21 before the end of the third. Clarion then drove down to the five-yard line before being stopped on fourth down. On the very next play, St. Marys’ running back run up the middle and into the twilight for a 95-yard TD to cut the lead to 40-28. With the game getting a little close, St. Marys recovered a fumble and were looking to move the ball with quite a bit of time left in the fourth. The drive stalled, and their momentum fizzled as the time just ran away from them. Clarion outlived them more than St. Marys lost. They were sitting on their lead rather than trying to put them away. The day was a beautiful fall evening for football. On Friday, I went and witnessed Steubenville-Ursuline at Harding Stadium. When that game was over, I ran out to Richmond to see the last quarter of St. Clairsville-Edison. And on Saturday, was a triple-header. In the morning, I left Steubenville eastbound on US22 to route 18 to US30 to a small dot called Hookstown, home of South Side High School (a rural Beaver County high school). The South Side Rams were 1999 PIAA ‘A’ champs having gone undefeated, 15-0. However, they’ve been down the last few years, winning one game in two years. This year they’ve opened winless through five games and were facing a relatively new school, Our Lady of Sacred Heart. Their stadium is part of the Richard J Ashcroft Athletic Complex. The stadium itself doesn’t appear to have its own name. If you’re in the area for a game, it is a nice facility in the picturesque rolling hills and valleys of the Ohio valley area. Enclosed on three sides by trees and forest, and to the north by a practice field and the high school, the stadium does feel entirely confined. Tickets were $4 and the program was $4. Concessions were the basic southwest PA fare. Included were Halushki, Pierogies, and sausages. Also, were a lot of desert items including apple dumplings. Something Burgettstown also does. An 8-lane track surrounds the grass field that’s already turned to mostly barren lined dirt. OLSH (shortened and pronounced as one word: olsh) had just started playing football a few years ago. The Rams opened with a touchdown and a field goal before OLSH finally got on the board to make it 9-7 at the half. The homecoming festivities were conducted at halftime with the naming of the queen. A third quarter touchdown and an early fourth quarter touchdown made it 22-7. OLSH was moving the ball before being stopped on fourth down at the 22 yard line. On the next play, South Side run it right up the middle to the south endzone to put the game away, 28-7. After that, it was a short drive down route 18 to Burgettstown to catch the second half of their game with Seton-LaSalle. Halftime was underway as they announced their homecoming queen. Their concession stand had sold out most everything decent due to a surprisingly large crowd. The crowd, however, did nothing to affect the game. Burgettstown was already trailing 42-0. Another touchdown in the third quarter ran the lead to 49-0 before Burgettstown finally scored on a long drive in the fourth. It was their third touchdown in six games (all in garbage time). Burgettstown’s Hill Memorial Stadium generally has lights, but they’ve been taken down this year. The lights are supposed to return for the final game of the season against Keystone Oaks. However, their homecoming game is always scheduled for Saturday afternoon. Hill Memorial Stadium sits on the side of a hill. Not a big surprise, really. Route 18 runs right behind the stadium. There are no seats on the far side of the field. The concession stand and bathrooms are to the north and parking is quite sufficient to the north in a gravel lot filling the entire area at field level in a relatively residential area. After that, it was on to home for dinner and then over to Harding for Catholic Central-Barnesville game that was over before they suited up. Crusaders won 63-14. Now, as I foreshadowed, I’ve seen quite a few non-Ohio games this year. I did recap the Week 0 games in Kentucky. But I’ve generally not had time to recap other games. After 10 games in Week 1 (Crosstown Showdown and OVAC Kickoff), Fridays have all been Steubenville games. Saturdays have been a mix of local unlit fields hosting games and the occasional oddball game that’s scheduled for Saturdays rather than the traditional night spot. – This was a fun game at the Noble County Fair. Great atmosphere and a very cool stadium setup that’s a bit unusual. – Root Sports out of Pittsburgh airs a game-of-the-week and this year went back to using Thursday as their coverage. In Week 2 of the PIAA calendar, Root aired their first game and choose a great one. Central Valley play in Monaca, Pennsylvania. They are a merger of Monaca and Center, two former single-A schools that are now 3A. This is a matchup of the WPIAL final from two years ago. The game went to OT after a lightning delay after halftime. Montour scored first, and Central Valley scored. Opting for the win, Central Valley’s conversion was short of the goal and Montour walked out with a 28-27 OT win. – Two suburban Pittsburgh schools matched up in the second Root Sports game. Penn Hills’ stadium just received field turf courtesy of the NFL and Pittsburgh Steelers. Very nice stadium. Quite large, but again only on one side of the field. Penn Hills had a 7-0 lead until late in the game Baldwin scored and went for two to make it 8-7. Penn Hills drove the field late and got a field goal with seconds left to win, 10-8. – Another Root Sports contest brought me to the small steel town of Monessen, roughly halfway between Pittsburgh and Oblivion. Monessen is an old, depressing looking town with a small cramped stadium shoehorned into a residential area behind the school. Memorial Stadium is definitely one of the more unusual high school fields. Dug into a bowl from the sloping hillsides, the stadium is entered from the top. Ornate cornices situate the top of the fencing surrounding the stadium. Similar to many Pittsburgh area schools, seating is per side and no crossing of the two groups takes place. However, the visiting team stands before the home fans and vice versa. The baseball field sits to the north and acts as the continuation of the north endzone. The field had an unusual slope as it crown went from the home side to the about 2/3rd the way across the field. Then a small shallow spot then rose to the other sideline. Clairton went into this game on a huge winning streak. It took some time, but they finally destroyed the Monessen Greyhounds, 52-7. – Central Catholic was to host this game at Fox Chapel High School, but their hosts declined after vandalism was committed to their property after Fox Chapel had hosted Central Catholic the week prior. So, the game was moved to NexTier Stadium in Harmony, near Zelienople. Seneca Valley’s stadium is the first high school only stadium I know that has sold the naming rights. Central Catholic had given up only three points all season at that point. Seneca Valley won easily in a light rain, 34-7. – As recapped above, I chose this game over Knoch-Franklin Regional because it was closer and I had wanted to see a game here since I first drove through Clarion. Now, for Saturday games after Week 1, I’ve seen them in Bowerston (Conotton Valley), Bellaire (St. John Central and Bellaire), Yorkville (Buckeye Local), Steubenville (Catholic Central), Warren (JFK), and East Liverpool for Ohio schools. I’ve seen Wheeling Central host Weirton Madonna (three quarters after the Buckeye Local game was called early and Wheeling’s game was delayed two hours). The first Burgettstown game wasn’t any better than this one. A dreary day in a partially filled stadium. A huge first half lead led to a running clock and a shutout loss. West Middlesex hosted a rare Saturday night game against Moniteau (A district 10 vs. District 9 matchup). A nice campus stadium. Only interesting thing to really happen was someone was arrested on the hood of my car in the parking lot. … That wasn’t me. In week 5, Ambridge hosted their homecoming game against Moon. Now, the Bridgers have a very cool stadium (Rubenstein Stadium) that has a bridge in the stadium connecting the school to the top of the north edge of the stadium. The pressbox is misplaced as it sets into the stadium and actually blocks the view of a lot of seats. And the night game was the rivalry with Beaver and Beaver Falls that started in a monsoon that absolutely drenched me. Now, this was a good game, but the stadium and setup are just lacking. The school feels like a penitentiary and the stadium is old and decrepit. There is no sense of appeal. The turf seems flat. And all the restrooms are in the school which is quite a distance from the game. It also requires you to leave through the gates. In all, I’ve seen 47 games so far this year through Week 7. Well on pace to surpass the 73 I saw last year. Now, for notes from last year. It appears that Grass Range/Winnett in Montana are not playing a varsity schedule this year. This team had only one senior last year and won the game I saw over Rosebud. It appears they may go back to a varsity schedule next year. But, there’s a slim chance I may have witnessed the school’s last ever varsity game. I hope not. I very much enjoyed the game in the little tiny dot on the map in Big Sky Country.